Also serving communities of Sand Springs, Sapulpa, Bristow. There are 22 Assisted Living Facilities in the Tulsa area, with 21 in Tulsa and 1 nearby. The average cost of assisted living in Tulsa is $3,524 per month. This is higher than the national median of $3,346. Cheaper nearby regions include Owasso with an average starting cost of $3,125. To help you with your search, browse the 181 reviews below for assisted living facilities in Tulsa. On average, consumers rate assisted living in Tulsa 4.1 out of 5 stars. Better rated regions include Claremore with an average rating of 4.5 out of 5 stars. Caring.com has helped 24 families in Tulsa find high-quality senior care. To speak with one of our Family Advisors about assisted living options and costs in Tulsa, call (855) 863-8283. Tulsa, Oklahoma, is located in an area known as "Green Country" due to its robust vegetation and many lakes and hills. The area is also home to more than 48,000 seniors, some of who may benefit from living in an assisted care facility. To support those seniors, Tulsa has 21 assisted living facilities located within city limits. Assisted living centers and Residential Care Homes (RCHs) in Tulsa and the rest of Oklahoma are overseen by the Long-Term Care Services Division of The Department of Health. Oklahoma is tax-friendly towards seniors. While retirement savings account income and pensions are partially tax, no taxes are levied on Social Security benefits. This might be good news to Tulsa seniors who rely on these types of income. Tulsa Transit provides bus service to most of the city. Seniors and those on Medicaid are eligible for reduced fares, which can be purchased individually or in 7- or 31-day unlimited ride packages. The cost of living in Tulsa is 89.6, considerably lower than the national average of 100. Groceries also rank lower than the average, but seniors can expect to pay more for healthcare and transportation, which both rank higher than the average. The Tulsa area is home to world-class medical facilities, including Hillcrest Hospital South and Saint Francis Hospital, in the event of medical emergencies or illness. Tulsa has a violent crime rating of 48.3 and a property crime rating of 74.3, both significantly higher than the national averages of 22.7 and 35.4, respectively. Despite the high crime rates in the area, seniors living in assisted living facilities are kept safe due to security systems, alarms, and cameras. Residents of Tulsa enjoy all four seasons with summer highs reaching 93 degrees and winter lows of 27. Despite getting 43 inches of rain and nine inches of snow, the city still gets 227 sunny days annually, 22 more than the national average of 205. Families may want to ensure that facility rooms have individual climate controls to keep seniors comfortable regardless of the weather. Assisted Living costs in Tulsa start around $3,524 per month on average, while the nationwide average cost of assisted living is $4,000 per month, according to the latest figures from Genworth’s Cost of Care Survey. It’s important to note that assisted living rates in Tulsa and the surrounding suburbs can vary widely based on factors such as location, the level of care needed, apartment size and the types of amenities offered at each community. 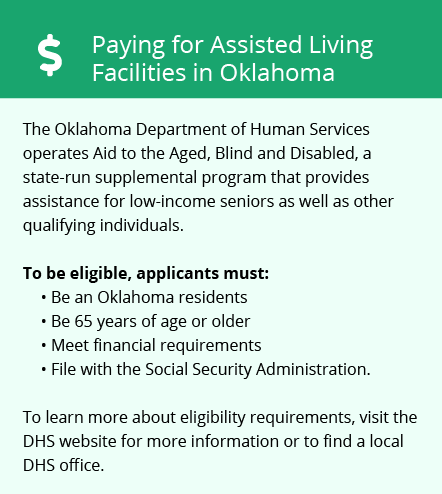 Tulsa seniors who need help with the costs associated with assisted living can apply for one of Oklahoma's two Medicaid programs: the Personal Care Program or the Advantage Program Waiver. Tulsa and the surrounding area are home to numerous government agencies and non-profit organizations offering help for seniors searching for or currently residing in an assisted living community. These organizations can also provide assistance in a number of other eldercare services such as geriatric care management, elder law advice, estate planning, finding home care and health and wellness programs. To see a list of free assisted living resources in Tulsa, please visit our Assisted Living in Oklahoma page. 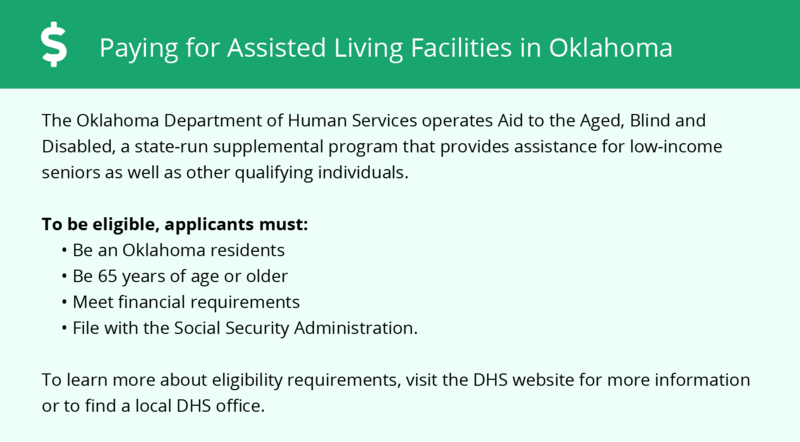 Tulsa-area assisted living communities must adhere to the comprehensive set of state laws and regulations that all assisted living communities in Oklahoma are required to follow. Visit our Assisted Living in Oklahoma page for more information about these laws.